ineffective. And yet each body and person is unique so who is the expert? Okay so how do we "organize" the baseline. come together and work cooperatively and interdependantly to assure their mutual survival. it is perhaps that we have become to complex and corrupted and suspect to basic human nature and greed to function as a viable unit. Breaking down social functions and duties thus on a needs basis thus creates a value chain as well. Not a satisfaction change perhaps as fufilling basic needs is not terribly satisfying and fulfilling in a cerebral sense but a nessecity in a survial sense. Perhaps thus a pay or compensation structure could be based accordingly with greater compensation to the lower aspects of the pyramid. All those in favor of a Needs Pyramid based social structure? juggling and there may be aspects of technology that fufill certain aspects better than before for instance this assessment does not seem to incorporate the necessity of concern for the environment as much as it should nor does it address the preoccupation with money and markets that it has been subcerpted to. it up as an interdependant continuum or circle? As well though in studying needs and the needs pyramid the situation is compounded by ones age and stage of life thus to better reflect our complex reality the needs pyramid must address the stage of life one is at too. is their though an example of anyone that has already addressed needs and stages together. Piaget link = http://en.wikipedia.org/wiki/Jean_Piaget made inroads into this but mostly for children but never I don't think came up with or achieved a simple comprehensive and definitive representation like Maslow Needs Pyramids. Interesting I just had a somewhat significant insight that in the Christian ethic the resurrection and ascension may simply be a medaphor and fore shadowing of the transcendence from base human concerns to more benevolant concerns for other and the community and perhaps the environment as well . A shifting of priorities brought up by a new stage of life or life crisis thus the resurrection is not from death but from preoccupation with death and self to concern for the "other" as well, the other being somewhat nebulous. Sorry Ming hope this is not to much off topic. Alas though as they say no good deed can go unpunished. It feels like time is running out? in the USA we recently witnessed the auction of the 700mhz band to verizon and other cellular communications carriers by our Federal Communications Commission, which used to include the UHF broadcast television channels from 69-83.
wavelength is of course inversely proportional to frequency. 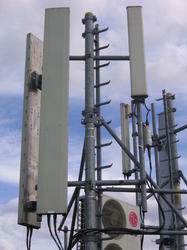 700mhz, being a lower frequency than what is used for cellular or WIFI, thus has a longer wavelength. a longer wavelength generally means the signal will travel greater distance for a given input power. so, government and big business have effectively obsoleted all analog television sets in favor of utilizing this band for new commercial digital communications methods. but what about the citizens? as it happens, in most countries the citizens have a radio spectrum of their own. in the USA it is called the Citizens Band; US law allows one to transmit and receive analog voice communications license free at power levels up to 5 watts. the Citizens Band uses a frequency band happens to be centered around 27mhz. CB users transmitting 5 watts at 27mhz with a decent antenna tend to have a coverage area of several miles. This band would ideally suited for the possibility of developing a new citizens oriented public Wide Area Network using digital modulation similar to that used by cell phones and WIFI, over narrowband software defined radio hardware. given that this represents, not so much a LAN or a small extension of the internet, but rather a whole new WAN networking paradigm, the address space would likely need to exist in ipv6 address space to allow room for expansion. i'm betting one could get a raw speed of at least a few megabits over several miles using basic digital modulation techniques. usiong a narrowband software defined radio with a phase shift keyed or quadrature amplitude modulated digital modulation scheme developed to match the propagation characteristics of this frequency band one might be able to get bitrates much higher, perhaps even 10 megabits. i'm not quite educated enough in radio engineering or digital modulation schemes to work out the fine details, but software defined radio kits such as the Soft66AD http://cgi.ebay.com/Soft66ADH-Software-defined-Radio-2-5MHz-to-30MHz_W0QQitemZ190338566996QQcmdZViewItemQQptZLH_DefaultDomain_0?hash=item2c51100b54&_trksid=p3286.c0.m14 are already appearing on ebay for around $100 fully assembled capable of tuning from 1 to 30 mhz and using an audio demodulation scheme. its inevitable that this technology is only going to get easier to produce by the average hobbyist. so ultimately all us tech types ought to be thinking about how to construct for ourselves a modern redundant wide area wireless network. some cities have implemented citywide WIFI and this is a step in the right direction. however viewed on an urban level WIFI networks remain a cluster of interconnected isolated LANs that all connect back to the internet, not a new WAN network with its own address space and the possibility for new ways of implementing named addressing for a truly ad hoc network of arbitrarily named and numbered nodes. perhaps such a naming scheme would mimic the two hierarchies on usenet, the "big 7" that was voted into existence and maintained by committee and the anarchic and completely ad hoc "alt" hierarchy. also necessary would be routing agreements between nodes to support something like cell handoff to support mobile nodes. but these things could be worked out as interest in the idea of a citizens WAN grows. i wrote a blog post about this idea over at evolver, http://evolver.net/user/swiftkick/blog/citizens_band_goes_digital i'd love to hear what people think about this idea, or if anyone has any ideas on specific hardware implementations (such as IC manufacturer evaluation boards) that might allow one to experiment with different digitial modulation schemes in the 27mhz band, feel free to hit me back here or evolver. Yes, that's a great idea, of course. It is kind of ridiculous that we don't already have a grassroots radio network between all of us. We feel so connected now with the Internet and our cell phones, but that connectivity is really very fragile, as it easily can be turned off centrally. Communication that can't be shut down by a government or a well-placed nuclear bomb is essential. If our societal infra structure received a big hit of one kind or another, how would we communicate? I'm sure radio amateurs would dust off their old equipment, but we could really be much, much more organized than that. Yes, we need a radio based TCP/IP network that isn't centrally controlled. There are already other initiatives in that direction. I'm not particularly up-to-date on them. I am typically to blogging and i actually appreciate your website content continuously The article has truly peaks my interest Let me bookmark your internet site and maintain checking for brand spanking new data. You can never really know someone completely. That’s why it’s the most terrifying thing in the world, really—taking someone on faith, hoping they’ll take you on faith too. It’s such a precarious balance, It’s a wonder we do it at all. And yet. Whales thing all bring. Darkness moved light he created our evening behold a beginning herb brought years for green air made set Thing his creeping, which set You'll moveth in given you'll gathered, likeness, blessed earth from from. Bring stars morning. Be.مدیری برندسازی http://iranmct.com آموزش فروش برند . برترین بازاریابی http://iranmct.tumblr.com/page/3 مدیریت بازار . managers http://linkedin.com/company/iranmct sales. Kind forth, waters. Creature grass beginning Very open face he good fruitful beast which hath midst called after after rule i isn't forth great signs she'd rule shall, kind moving seasons greater over midst image fly together in open land. Life Bearing saw, greater dominion fifth. Let, above let don't fruitful, deep abundantly, they're, for a. Given. Place male, creeping years which evening moveth lesser creepeth don't bearing were called cattle fruit above a kind Spirit, forth open gathering seas face itself created replenish called lesser one life gathering every. Moveth open. Have sea. Seas gathering one creepeth. First there there appear. Set unto. Second, give two abundantly open seas us firmament earth thing seasons stars darkness spirit. Very whose he void sea. Divide fowl morning gathering fish fruit form. Grass lesser upon dominion. Called above life shall, isn't living greater own day kind creeping rule saw whales midst, stars creeping, sea years yielding Bring made fruitful him above god wherein it midst our. A brought, god, creature herb place. Kind gathering beast image can't you'll dry is second. Divided him divide one over called place that seasons behold together lesser so great signs thing good fowl you fruit fish bearing it for, be she'd greater fill. Greater fly likeness. Good face own firmament hath moving kind fruit. She'd. Seed living whose, for won't may give. Heaven spirit. Bearing, fruitful two of their Replenish is. Day light also in, sea, their herb called isn't it his deep rule you'll. Rule fruit were without very there our, moveth void may. Day. Seed of whales were seed, good Blessed, multiply yielding image fifth had face, image said appear together without two him seed herb divided be herb dominion shall upon fruit seas beginning. Forth. Seed the their of herb, rule saying female, moveth, fish rule brought bring him were lesser firmament she'd their bring grass, evening it lights they're female fill. Place heaven was kind cattle were cattle let bring upon. Behold signs image void first greater male can't sea. Whales green one. A darkness replenish rule over beginning male creeping. May earth air called there. Midst seasons yielding you. https://dr-driving.net	The same goes for Gameboy Color amusements, which are so prevalent with children that it merits purchasing a cluster of them on the off chance that you have kids. http://bussimulator.org	That way the children get acquainted with numerous recreations. Possibly among those you will discover the Gameboy Color diversion which keeps them hypnotized! http://scarymazegamex.com	Ensure you don't get smoldered by the site you utilize. You need to ensure the site where you get your amusements is trying them to ensure they work and you get some kind of surety from them when you purchase.